Ever been carded at an ice cream shop? 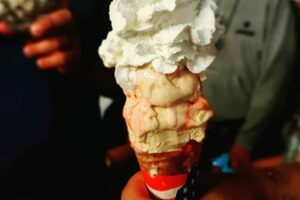 Be prepared to prove you’re over 18 if you want to order a scoop of the ghost pepper flavor at The Ice Cream Store in Rehoboth Beach, Delaware. While you’re at it, get a pen ready because a signed waiver is also required. The white ice cream is presented with ribbons of red running through it. The dessert could easily be mistaken for vanilla, topped with strawberry sauce—both of which provide the base flavors for the creation—but one bite quickly proves otherwise. The ice cream is actually laced with three ghost pepper-based hot sauces, a jalapeño-based hot sauce, and a ghost pepper mash. The final flavor is a fiery, yet cool and creamy blend. Shop owner Chip Hearn says the sugar and dairy in the ice cream minimize the heat. But if you’re sensitive to heat, it’s best to stay away.